Welcome to Marlin View! Unsurpassed ocean and beach views from almost every room of this luxurious, professionally decorated 3800 SF home. Spacious covered porches and sundeck to enjoy breathtaking sunrises, dining, or just sunbathing and relaxing. Located on the beach and directly across the street from Marlin Quay Marina, which allows for not only incredible beach and ocean views but stunning sunsets over the marshes of Murrells Inlet as well. Just steps to the beach via a walkway from the backdoor or walk across the street to the marina for boating. Large open living area with wet bar equipped with stand-alone ice maker. Three ocean front master suites with private baths. For added convenience there are TV’s in every bedroom. Exterior amenities include a private 16 x 32 in-ground swimming pool, plenty of spacious covered parking, double exterior showers, and a picnic table. Our rates are ALL-INCLUSIVE which include all linens, taxes and fees. A one hundred and twenty (120) day notice is required for cancellation. Reservations that are cancelled more than one hundred and twenty (120) days prior to the arrival date will incur a cancellation fee to cover clerical expenses. Cancellations or changes that result in a shortened stay or are made within 120 days of the arrival date forfeit the full advance rental payment and damage/reservation deposit. Reservations are nontransferable; requesting to change or transfer a reservation to another home, date, or person is deemed a cancellation of the current reservation. Guests shall not assign their rental agreement or sublet the home, in whole or in part. We cannot make substitutions or refunds for early departures and no-show reservations. If paid, the Red Sky Travel Insurance is not refundable. We were only a group of six but looking for a main room for our family and inlaws to relax and spend time together. The house was perfect for this! A king bedroom just off the main room was perfect for my inlaws with limited mobility. The main room had plenty of table seating as well. 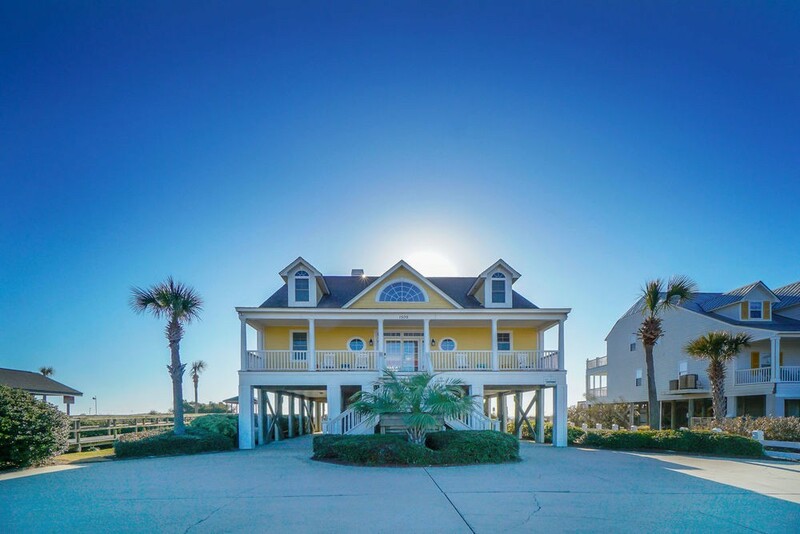 The home is beautifully situated on the beach with marsh views out the front. You could sit on any porch and see water. It was very relaxing, enjoyable and the beds had great mattresses--all slept well! Kitchen had a Keurig which was a big hit with my crew. The Gulfstream Cafe is a nice restaurant just steps from the home that we enjoyed too. We love the house and location. And Sea Star personnel made every effort to make our stay enjoyable. The Marlin View is always a wonderful home to stay in. The home is beautiful and always clean. There were a couple issues when we arrived but they were taken care of promptly. We love the area so much that we have been looking to buy home there. We highly recommend the Marlin View to anyone one. It was a wonderful week with our family and the house met all of our expectations. No complaints from any of us. We did a lot of cooking and kitchen supplies and appliances were outstanding. Huge refrigerator and pantry was just what we needed. Loved the location and the weather was perfect. Bedrooms fit all of our needs and even used the sofa bed as well. Thank you for provided a great beach home. This house was perfect for our family of 20. We had 15 adults and 5 children and it was very spacious for all of us! We loved the openness of the downstairs dining and living room allowing us to be together whether we were playing games, working puzzles, or watching tv. We also enjoyed the many options for sitting outside watching the ocean as well. The house was very clean and updated throughout. We would definitely recommend this home for large groups or families! Had a great visit to Garden City and the Marlin View house. Great views of the ocean and the inlet. Pool was great. Found house to be accurately described and it was clean. Stove top blew a fuse but was repaired as soon as a part came in. The house was clean and well-maintained. Everyone in our party mentioned that the place was spacious and no one felt crowded. Great parking situation. Really liked the ease of check-in and check-out app. Would definitely stay here again! Love Garden City/Murrells Inlet for the restaurants and the non-crowded beach. We spent 5 nights in this beautiful home right on the beach. The views are amazing. The house is perfect for a large group. There were 8 of us and there could easily have been more. Each bedroom is unique and comfy. The kitchen is a dream.....spacious, with everything you need. Don’t bring ice; there are 2 ice makers! There is also a Keurig machine and a regular coffee maker. We loved the huge front porch on two levels. Twice we saw dolphins swim by! What a treat! The beach is sandy and really quite private. We LOVED staying at Marlin View!